Australian vocal and percussion group Coco's Lunch are dedicated to composing and performing original and inspiring music. Their scintillating songs for young people are clever, catchy and full of zest and children can't resist joining in. Renowned for their extraordinary song writing, disarming originality and stunning live performances, Coco’s Lunch have been nominated for a host of Australian music awards. These five women singer/composers have received standing ovations for their concerts for adults and children throughout Australia, Asia, Canada and Europe. In 2005 their concert for Festival Vancouver at the University of British Columbia was recorded and broadcast nationally by the Canadian Broadcasting Commission and in 2006 they were invited to headline the 7th International Taipei Choral Festival. Coco’s Lunch have recorded several independent albums of original songs, including two brilliant children’s albums, and have been at the forefront of original Australian vocal music for over a decade. Performed by groups and choirs worldwide, their award-winning work has also been featured on countless compilation albums, anthologies, documentaries and film. Coco’s Lunch have ignited the hearts of children in schools and concert halls throughout Australia and Asia, with over 400 concerts and workshops with the Musica Viva In Schools program. With a rhythmical vitality, humour and musical sophistication that sets them apart from most children’s performers Coco’s Lunch have performed their magical interactive shows in sold-out seasons at the Sydney Opera House (Babies Proms), the Famous Spiegeltent, the Victorian Arts Centre and Brisbane Powerhouse for several consecutive years. Their debut CD for children WALLY WOMBAT SHUFFLE (1998) was released to outstanding reviews by media and music educators alike and has since become a children’s classic. Though an independent release, the album has sold thousands of units at performances alone, with parents re-ordering second copies after originals have been played into extinction! 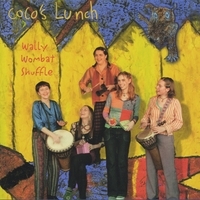 Wally Wombat Shuffle features Coco’s Lunch hits such as Coco’s Samba, Hitch ‘Em Up, Baa Baa, Spin My Wheels, Dizzy Spin, Spooky and Wally Wombat Shuffle! Great to use as a teaching tool for primary music. Catchy songs, easy to teach and full of creative ideas.